Whitworth Theatre will stage its fall production, William Shakespeare’s Richard III, Oct. 16, 17, 23 and 24 at 7:30 p.m., and Oct. 18 at 2 p.m. The performances will take place in Cowles Auditorium at Whitworth University. General admission: $10; students and seniors: $8; Whitworth students free with valid student I.D. For tickets, please call (509) 777-3707, visit www.whitworth.edu/theatretickets, or purchase at the box office starting one hour prior performance (cash or check only). The television show Game of Thrones has nothing on Shakespeare when it comes to tales of power, corruption and betrayal. 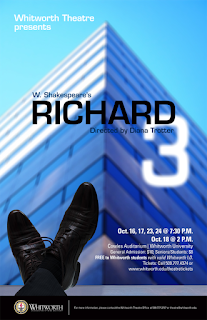 In Richard III, directed by Whitworth Professor of Theatre Diana Trotter, the York Brothers have succeeded in their hostile takeover of the vast Lancaster Corporation. Not content with being merely a department head, younger brother Richard has his eye on the Big Office and will stop at nothing to get it. Join us for this contemporary interpretation of one of theatre’s most notorious and entertaining villains. Nancy Hines, director of communications, Whitworth University, (509) 777-4638 or nhines@whitworth.edu.